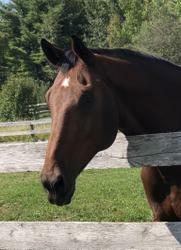 13 year old 17.3hh KWPN registered Dutch Warmblood Gelding. Extraordinary opportunity for a dedicated Jumper or Dressage rider. 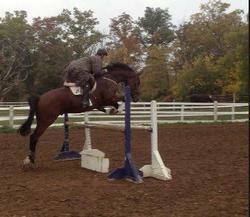 Well schooled on the flat with solid dressage background and demonstrates a no spook/no stop Jump. Ring miles with bomb-proof disposition. Just a big lover with very sweet personality. This is a big guy standing at 17.3hh. Leaser would cover expenses and would be committed to staying on a training program. Option to show but not required. Located at a top of the line facility outside of Rockwood Ontario. Good Morning! Please post the horse under the 'Hunters' section named "Just Kidding" as LEASED. Once again I have received MANY calls and leads as to this horse being posted on your website. Thank you!